I have tweaked many versions till satisfied and present here one that I was most happy with. Cardamom/ Elaichi - 1 no. Clove / Laung - 1 no. Bay leaf / patta - 2 nos. 1) Wash and soak rice for 10 mins. Drain. 3) Make a paste of mint leaves, ginger garlic paste, coriander leaves. 4) In a cooker, add oil. Fry cinnamon, clove, bay leaf till slightly brown. 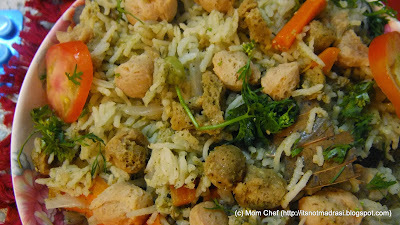 5) Add the above masala , onions and soya chunks and fry well till the masala is cooked. 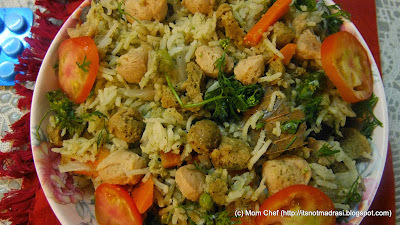 6) Now add the veggies and rice and fry for 2 more minutes. 7) Add salt and pour the remaining hot water and pressure cook for 3 whistles. 8) Serve hot with Raita and papad. Note: If using electric cooker, reduce water by 1/4 cup. nice n healthy pulav.. i have loved meal maker..
would love to join the marathon..